Last week I broke the news that the UK Council for Psychotherapy will be conducting an internal review into its handling of the John Smalley case, a fitness for practice hearing of a Jungian analyst. The review will examine how the UKCP managed to take over 3 years to conclude its investigation. The review won’t be asking why, despite seven allegations having been found proven, their panel didn’t so much as impose a caution, even after Mr Smalley admitted destroying his notes. I’ve documented in detail the various ways that the case has been mishandled. But even now I’m discovering new things that seem to have gone wrong. Recently I saw a letter from the complainant to the UKCP, written in August 2011 and remonstrating bitterly about how his case was originally dealt with by them. Rewind back to late 2009 and early 2010. The complainant had reported a series of allegations about Mr Smalley to his UKCP member organisation, the Independent Group of Analytical Psychologists. IGAP had ruled there was no case to answer. The UKCP is currently trying to reform the way complaints are handled. Under the old “two-tier” system, a complaint is first heard by the member organisation. If they reject it and the complainant isn’t satisfied, they can then appeal to the UKCP’s Central Final Appeals Panel (CFAP). This system is to be replaced by a new “single-tier” Central Complaints Process. The Smalley case is something of a hybrid of the old and new. The complainant took IGAP’s “no case to answer” decision to the CFAP, who ruled that this was “perverse and incorrect”. The CFAP then ordered a new hearing should take place under the Central Complaints Process. The complainant’s letter of August 2011 describes what happened when he appealed to the CFAP. UKCP took over 5 months to accept my UKCP CFAP application, which was excessive. I submitted my UKCP CFAP application on 1 February 2009 and it took UKCP until 6 July 2009 to accept it. The excessive time caused me considerable extra emotional and psychological distress on top of that already caused by the circumstance surrounding the UKCP CFAP application. The complainant may not have known it at the time, but this was to be the beginning of yet more delays after delays, with the result that the proceedings only finally concluded in March 2012. His letter goes on to describe some of the correspondence that took place during all of this initial faffing. After accepting my UKCP CFAP application UKCP twice wrote to persuade me to suspend my accepted UKCP CFAP and grant permission to UKCP to “request”/”invite” IGAP to reconsider my complaint, which was perverse. IGAP’s Complaints Procedure was formally completed before I submitted my CFAP application to UKCP. In fact UKCP CFAP is only available when the UKCP Member Organisation’s Complaint Procedures have been formally concluded…. Following receipt of the above “no case to answer” ruling from IGAP, that I considered was perverse and incorrect, on 1 February 2009 I submitted my CFAP application to UKCP. I included the letter that includes the above ruling in my CFAP application to UKCP. Then UKCP wrote to me on 4 August 2009 and attempted to persuade me to suspend my accepted UKCP CFAP and to grant permission to UKCP to “request [IGAP] to instigate an investigation of [my] original complaint” and to “invite IGAP to consider my complaint”…. Though I felt that I had made my position abundantly clear to UKCP, UKCP wrote a second time with a letter dated 17 August 2009 which again attempted to persuade me in the manner as before. I responded immediately in a manner as before in a letter dated 19 August 2009. IGAP’s Complaints Procedure rules were complete. Hence, had I taken UKCP’s advice, I would have had nowhere to stand ‘in law’ regarding my complaint against IGAP’s member according to IGAP’s Complaint Procedure rules. What he seems to be suggesting is that UKCP were offering him advice that could have derailed his entire complaint. That’s bad enough, but here comes the worst allegation of all. UKCP did not offer nor inform me of my need for representation at the UKCP CFAP hearing on 26 March 2010. I consider that I should have been treated as a vulnerable witness at the UKCP CFAP hearing. As it was I had to represent myself against IGAP’s legal team comprising a barrister and a solicitor. Although UKCP offered me representation (by UKCP Professional Conduct Officer) in the UKCP Central Complaints Process (CCP) (the UKCP disciplinary process that my compliant has since moved in to following my UKCP CFAP appeal being upheld on 26 March 2010), UKCP made no such offer of representation nor advised me of the need for representation for the UKCP CFAP hearing. At the very least I should have been informed of the need for representation. UKCP allowed me to walk into the UKCP CFAP hearing to face a barrister, a solicitor and two of the members of IGAP responsible for making the perverse and incorrect decision that was the reason for the CFAP process, without properly informing me of what a UKCP CFAP hearing involved and without providing adequate support of a professional, legal, emotional and psychological nature. It should not have been my place to have to make a technical argument based on the proper ethics and practice of psychotherapy. A decent, ethical and empathic psychotherapy organisation would understand this and would have demonstrated its understanding by supporting a vulnerable member of the public to achieve the right outcome from the UKCP CFAP hearing in a manner that caused least emotional and psychological distress. As it was I suffered enormous stress at the UKCP CFAP hearing. I had no idea that IGAP would be represented by a barrister or even that I was expected to make an argument. I understood that my allegations and my statement would stand on their own. As it was I had to speak at length before the hearing and make an argument that both presented my case and refuted IGAP’s position. I did not attend the hearing prepared for such an eventuality. I should have been represented by UKCP or have been advised by UKCP of the need for representation. This shrieks of a lack of care. If the above account is accurate (and the transcript of the CFAP hearing seems to corroborate it) then a vulnerable adult was suddenly, and without warning or time to prepare, expected to act as a litigant in person before a trained barrister. I’ve invited the UKCP to comment on these allegations, but they’ve declined to do so at this stage. Over the past few weeks I’ve been analysing the John Smalley case, a botched fitness to practice hearing by the UK Council for Psychotherapy, which took over 3 years to find seven allegations proven, but decided not to issue any sanction. This is indeed good news, though only partially so, as the review will only be of the length of time taken, and will not consider the eventual decision of the panel, which seemed to feel that seven proven allegations did not merit so much as a caution, even after Mr Smalley admitted having destroyed his notes. Separately to this, other parties have asked the UKCP to investigate how the complaint was initially handled by Smalley’s UKCP member organisation, the Independent Group of Analytical Psychologists. They want to know the IGAP found that there was no case to answer, a decision ruled “perverse and incorrect” by the UKCP Central Final Appeals Panel. Currently, there is no word on whether the UKCP will do this. Eventually, all the member organisations, including the IGAP, should be subject to the UKCP’s new Central Complaint’s Process. According to UKCP, that should be in place by the end of next year, though the IGAP seem rather off-message on that. Last week the UKCP responded to the Council for Healthcare Regulatory Excellence’s consultation on Voluntary Assured Registration. This proposed scheme will allow self-regulating professional bodies such as UKCP to obtain a “Quality Mark” from the CHRE (to be renamed the Professional Standards Authority). The Central Complaints Process is a key part of their aim to receive such a Quality Mark. The CCP was found severely wanting in the Smalley case, and in any case member organisations like IGAP haven’t confirmed that they’ll even sign up to it. If the UKCP is to deserve its rubberstamp from the CHRE, then it still has improvements to make. 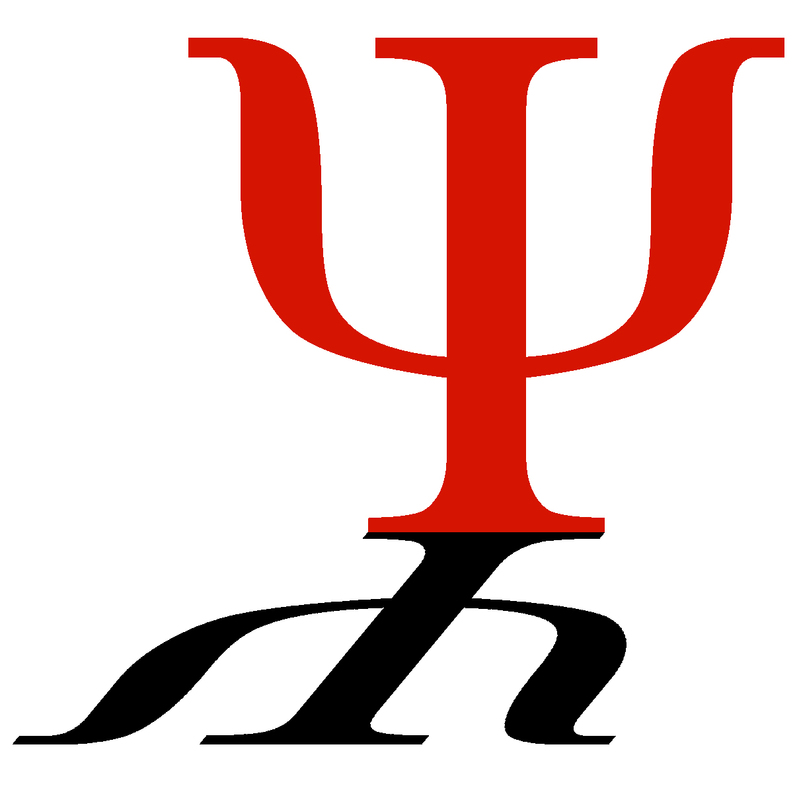 There’s been yet another twist in my exploration of the John Smalley case, a mishandled UKCP investigation into a Jungian analyst with the Independent Group of Analytical Psychologists. Josefa Bayes-King is a former IGAP member, now an academic living in Australia. She has left comments on my blog posts, stating her own concerns about the effect of Smalley’s statements on the reputation of the late Dr Anne Maguire. She also stating that she has contacted the UKCP asking them to investigate the ethics and practices of the IGAP. Obviously, I’m not a position to ascertain the truth of what happened in Smalley’s supervision, but the IGAP should be. Mr Smalley may no longer be registered with the UKCP but he is still an IGAP member, and still advertises his services on their website. It seems to me that there are two investigations that need to take place. The UKCP needs to investigate the IGAP, as called for by Ms Bayes-King. Also, the IGAP needs to investigate Mr Smalley. 1. Mr Smalley claims that his misconduct was sanctioned by his supervisor, the now-deceased Dr Anne Maguire. However, he did not provide any firm evidence of this. The complainant’s wife submitted a statement to the UKCP saying that she had spoken to Dr Maguire and does not think she did so. In addition, Ms Bayes-King does not seem to believe that Dr Maguire would have done anything of the sort. Hopefully, a definitive answer should lie in the late Dr Maguire’s records. 2. Mr Smalley told the UKCP panel, “It’s not my practice to keep notes and there’s no professional requirement to do so. Any notes that I did hold in relation to the case would have been destroyed when the relationship terminated.” Did Mr Smalley destroy notes or fail to make them in the first place? Either act would normally be considered professional misconduct. 1. The IGAP found that there was “no case to answer” against Mr Smalley. The UKCP’s Central Final Appeals Panel found this decision to be “perverse and incorrect”. The UKCP’s Central Complaints Process went on to find seven allegations proven against Mr Smalley. How did IGAP come to this original conclusion? 2. Why is IGAP’s complaints procedure not listed on its website? 3. Why is IGAP Code of Ethics not displayed on its website? Why, when I e-mailed them asking to see a copy of their Code of Ethics, did they not e-mail me a copy? 4. IGAP admit they have not sanctioned a therapist for misconduct for several years. Is this because of excellent behaviour by their registrants, or because of some problem with their complaints procedure? 5. Why, when I e-mailed the IGAP Ethics Committee inviting them to investigate the dispute over Mr Smalley’s supervision, and also his claim to have destroyed his notes, did they decline to investigate? 6. While Mr Smalley was under investigation for his misconduct, he was not suspended, and does not appear to have had any conditions on his practice as far as anyone can gather. What factors were taken into account when deciding not to do so? Anyone wishing to e-mail the IGAP Ethics Committee to make their views known can do so here. Time for another instalment on the Smalley case, a spectacularly mishandled fitness for practice hearing by the UK Council for Psychotherapy. In the two instalments we discussed two of the allegations that were found proven. One was that Smalley inappropriately set up two of his clients in a business partnership with each other. The other is that he made derogatory comments about other clients to the complainant, including one where he (jokingly, according to Mr Smalley) suggested to the complainant that he hang around after the session because he had an attractive female client coming. This time, let’s look at a dispute that erupted in the case regarding Smalley’s supervision. His supervisor was the late Dr Anne Maguire of the Independent Group of Analytical Psychologists, who sadly passed away in August 2011. Dr Maguire was a very eminent and respected figure, both as a Jungian analyst and as a dermatologist. In 1998 she gave the valedictory address at the funeral of Marie-Louise von Franz, founder of the CG Jung Institute and colleague of Jung. During the Smalley hearings, the question of supervision came up, particularly with regard to the inappropriate business relationship that Smalley set up. Later in the hearing, the questions returned to supervision. The “ethical position”, the panel later concluded, was that this was misconduct. If this is as described, then Dr Maguire gave him carte blanche to carry out this misconduct. It would be a stain on the reputation of an internationally-renowned Jungian. But did she do this? After the hearings, the complainant’s wife submitted a statement to the UKCP panel. In 2007, she and the complainant had a split in their relationship (one of the allegations found not proven by the UKCP was that the complainant seemed to blame Mr Smalley for the split). They subsequently reconciled and married. Around this time, she was attending analysis with Dr Maguire. Mr Smalley hotly denied the claim. 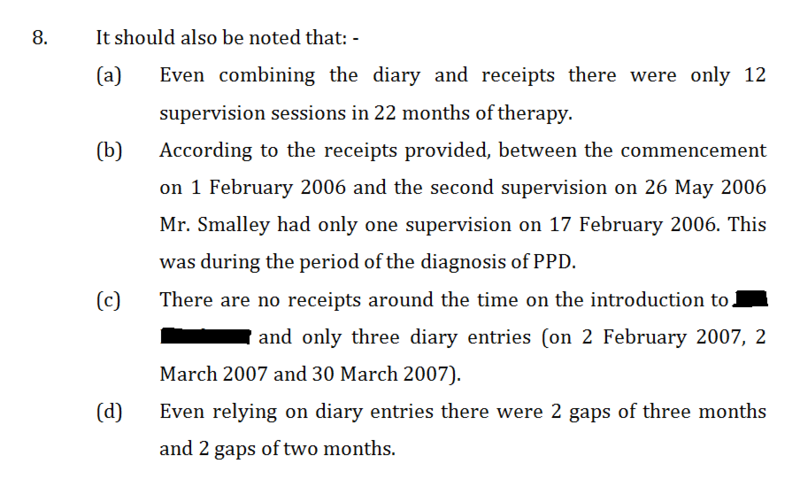 To corroborate his insistence that he discussed these matters in supervision, Mr Smalley gave the panel receipts for supervision, and entries from his work diary showing his appointments with Dr Maguire. However, Dr Maguire’s records were not presented. I have no idea if they were sought from her estate. The complainant then responded pointing out that the receipts and diary entries do not provide a complete record of his monthly supervision. The “diagnosis of PPD” mentioned is a reference to one of the allegations found not proven – that Mr Smalley (who is not a medical doctor) diagnosed the complainant with paranoid personality disorder. Here we have, as in many areas of this dispute, two wildly differing accounts. One, in which the late Dr Maguire sanctioned Smalley’s misconduct. The other, in which she hadn’t seen him for a while around the time of the inappropriate introduction. A record to show that Smalley had supervision was provided, but this record was incomplete. And in any case, it showed no evidence of what was actually said in those supervision sessions. This needs investigating, and the records need to be sought if they have not been already. It may not fall to the UKCP to do this, as Mr Smalley is no longer a member. However, Mr Smalley is still a member of the IGAP, as was the late Dr Maguire. They have a clear duty to investigate.